There are five kinds of housing available in Summerfield: single family houses, townhouses, condominiums, apartments and the Summerfield Retirement Estates (providing meals and housekeeping services). 153 Summerfield Retirement Estates (providing meals and housekeeping services). If you are interested in purchasing a home, townhouse or condominium, please contact any local realtor. If you are interested in renting an apartment or in the Estates, please contact their office directly. Summerfield was developed as a joint venture of the Tualatin Development Co., Inc. and Franklin Service Corporation. In 1973, the first model homes were built on Century Oak Drive. There was a grand opening and a great interest in this new adult community (at that time it was an age 40+, with no children under age 18 at home). The area we now know as Summerfield in Tigard Oregon has a rich history, see the Summerfield History Highlights. Construction on the 24,000 square foot Clubhouse began in 1974. 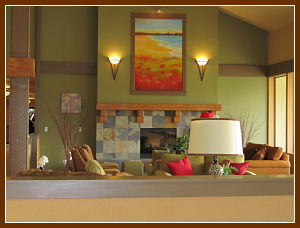 The beautifully landscaped golf course can be seen from many of the Clubhouse rooms and surrounding decks. From a banquet hall to a library to the arts/crafts room to the billiards room, the Clubhouse offered a wide range of facilities to support the numerous new committees, clubs and activities of the active association. Summerfield is governed by a Board of Directors. Each Board Member is a resident of the community, serves a 3-year term and volunteers their services. Board Members are nominated by a Nominating Committee and new Board Members are introduced at the Annual Meeting each July. The officers of the Board include a President, Vice President and Treasurer. Summerfield Civic Association employs an Administrator, Bookkeeper/Secretary, Maintenance person, Golf Course Superintendant and crew and a contract with a Golf Pro. Like many associations, Summerfield is reliant upon countless volunteers. Each of the committees and clubs are run by volunteer efforts and they are crucial in the continued success of Summerfield. Questions? Email SCA Administrator, Cari Lindsey at sca55@comcast.net or call 503.620.0131.